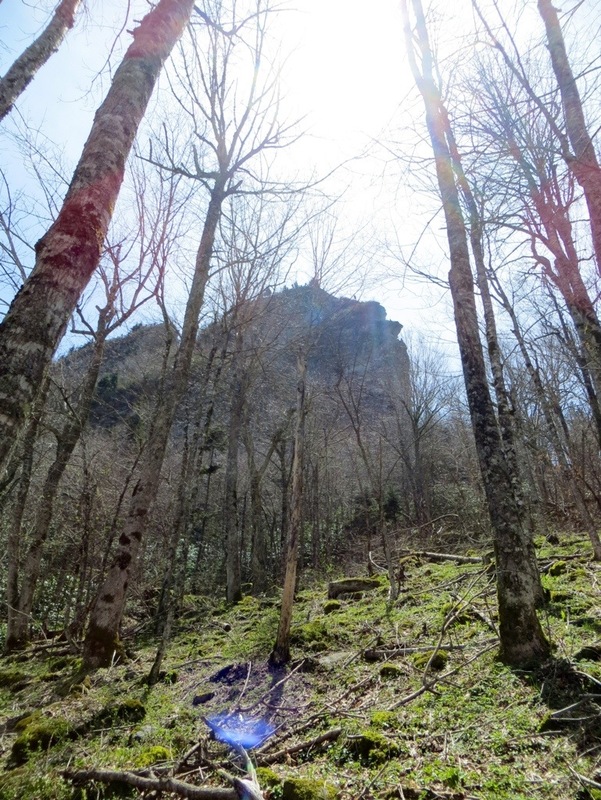 Profile Trail to Calloway Peak – A Beautiful Early Spring Hike on Grandfather Mountain! I ran into an old friend the other day whom I had not seen in years. One of the things mentioned was that her and her family loved seeing my posts and pictures online. The simple things in life like this makes doing my hobby so much more rewarding. 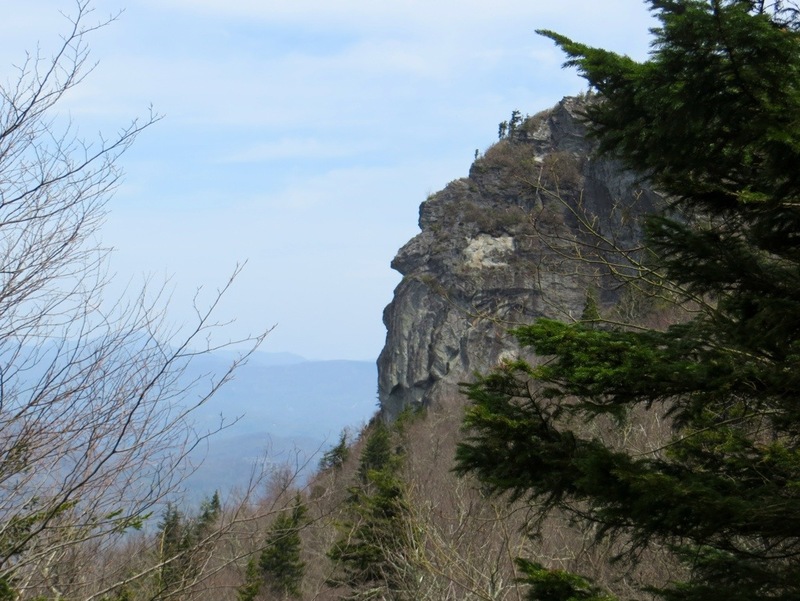 After a few minutes of talking, this person mentioned that her and her husband’s favorite trail was the Profile Trail on Grandfather Mountain. 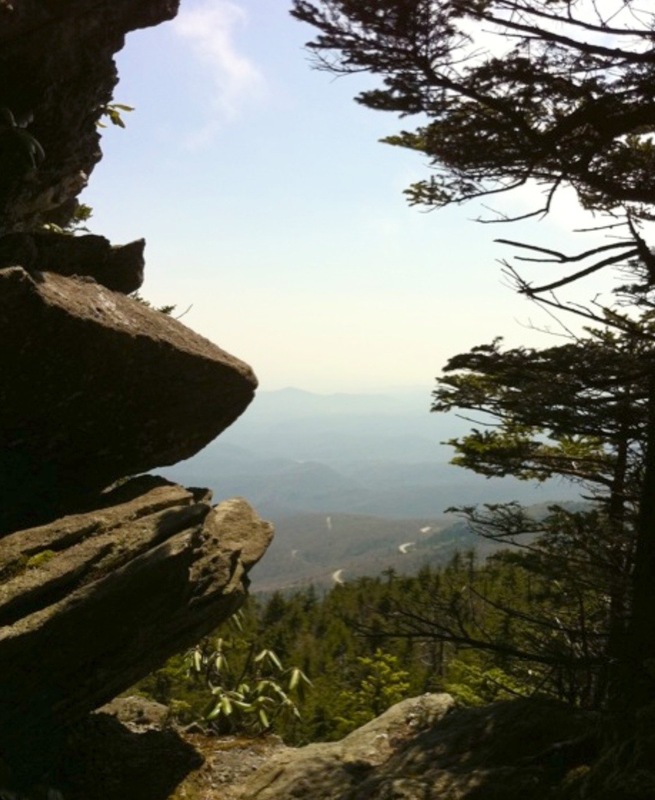 I recalled my last hike there, how good it was , and realized that it had been nearly 2 years almost to the date. 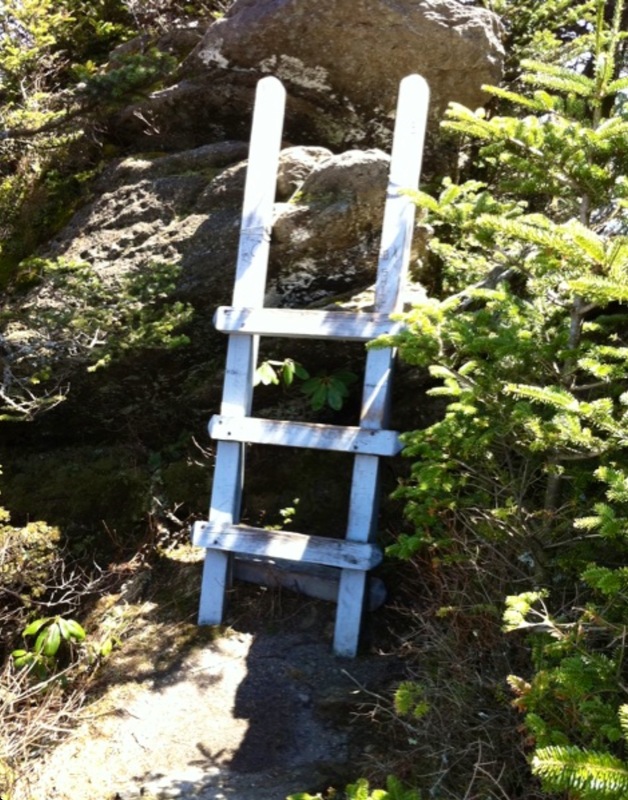 Boom, there was a great idea for my next hike. 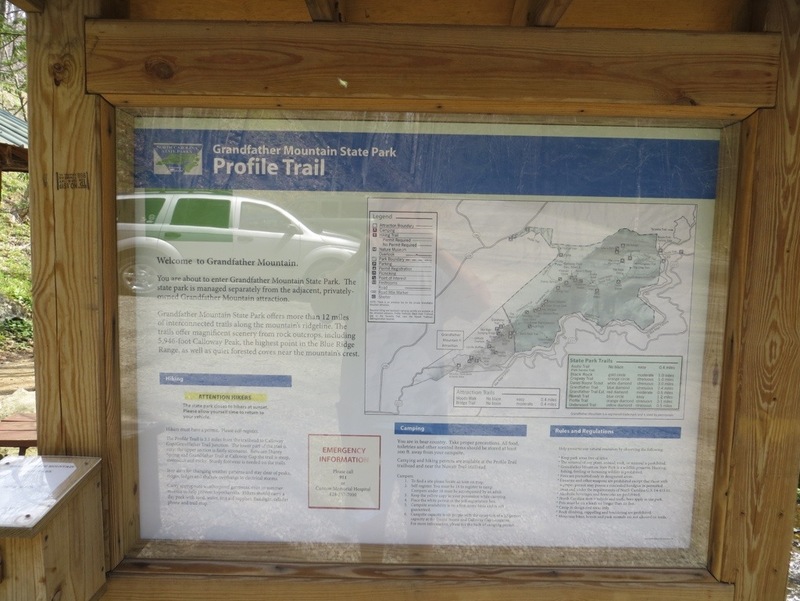 I had some business in a nearby town close to Boone, NC to attend to, and hiking the Profile Trail afterwards became my plan. Getting started, let me just say that this is an intense 3.1 miles each way or so that you are about to begin. It will take longer than most hikes of similar distance. 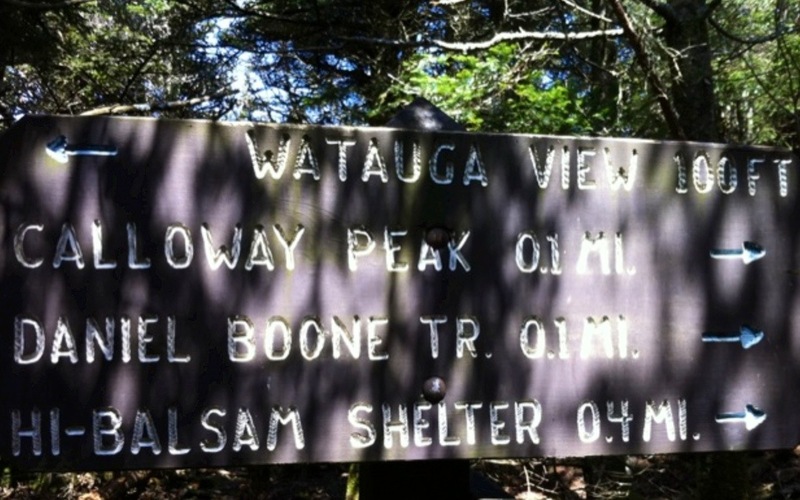 If you plan to hike to Calloway Peak, I suggest an early start time. 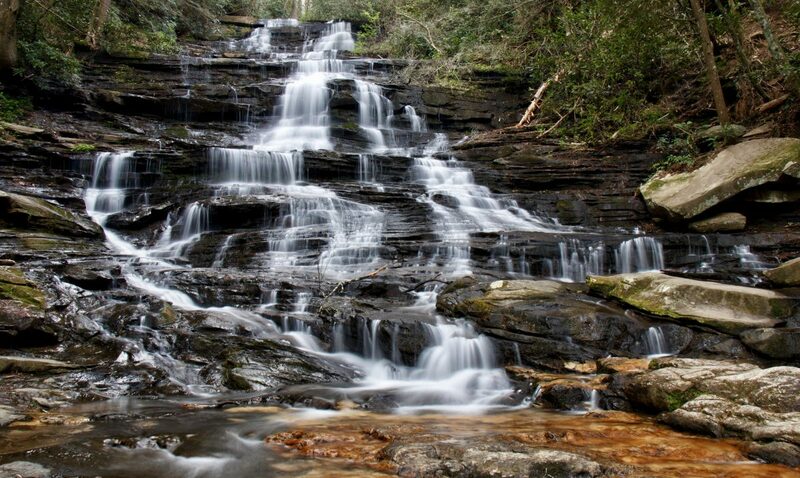 Make sure you have plenty of water for this climb. 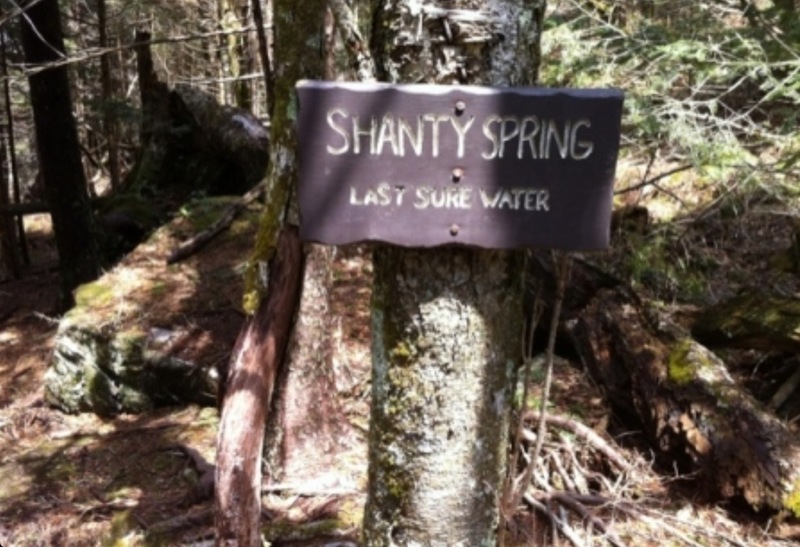 There is a chance to refill at Shanty Spring about 2 1/2 miles up, if you have a filter. 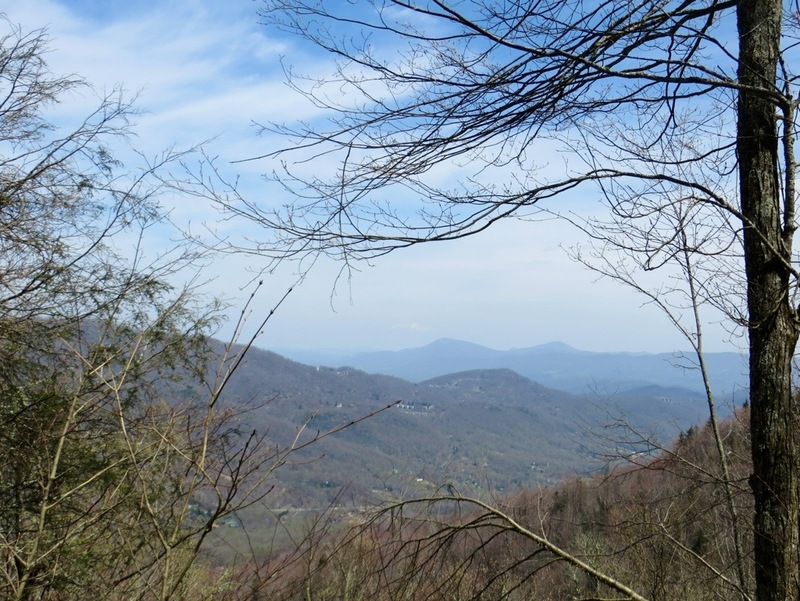 This hike is pretty much in 3 parts, a nice leisurely stroll along the Watauga River to begin, an intense, prolonged trail climb, then the last section which is even steeper with many large boulders to walk over, under, around, you name it. 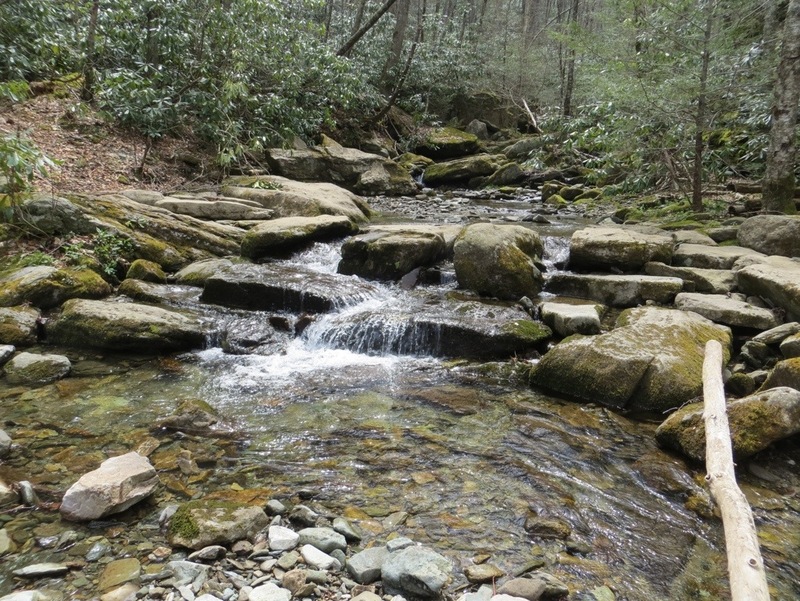 This trail starts immediately by crossing the Watauga River, which is more of a creek here, since it starts on Grandfather Mountain. 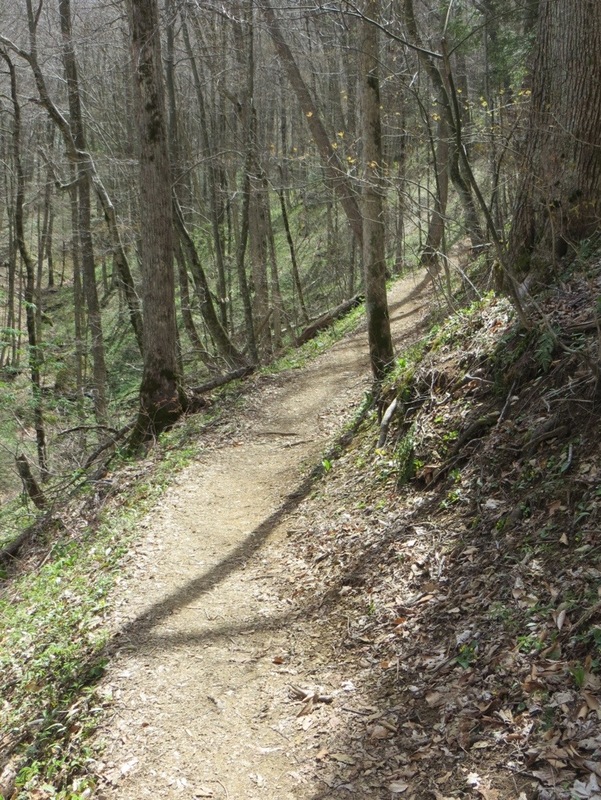 For the next half mile or so, the trail meanders up and down as you walk downstream. The turn to the right approaches soon and the climbing begins. 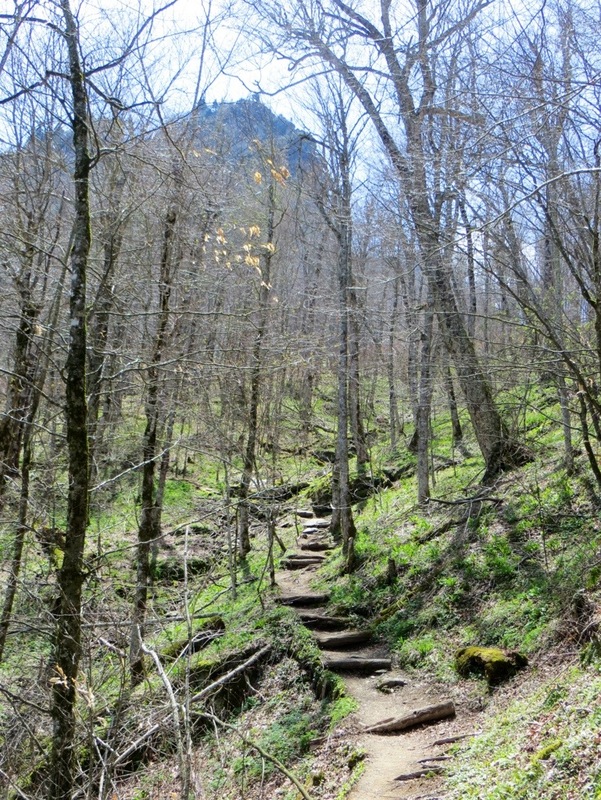 At first it is not steep, just climbing, around a few bends, creeks and streams. 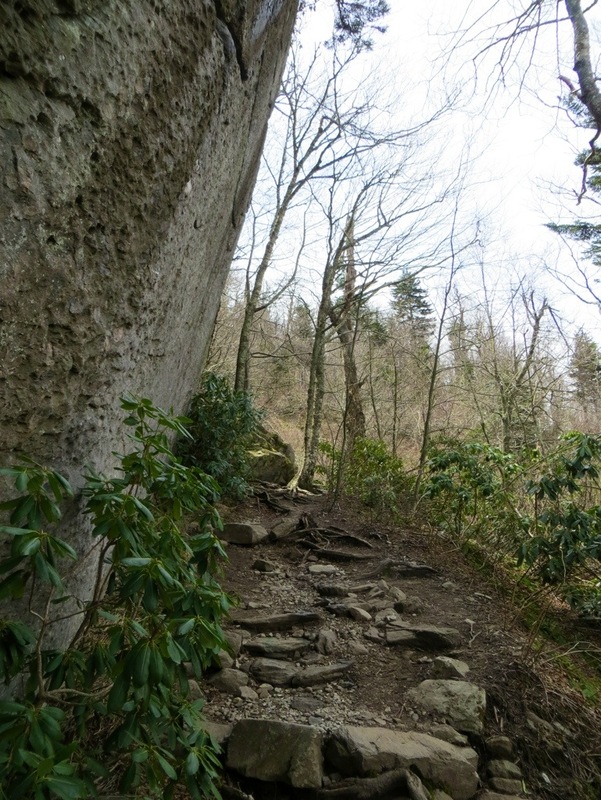 The trail leads to a large stream with huge boulders to maneuver around. The crossing is safe and dry, rock hopping some huge rocks. After this the climb intensifies a bit as the trail heads up. 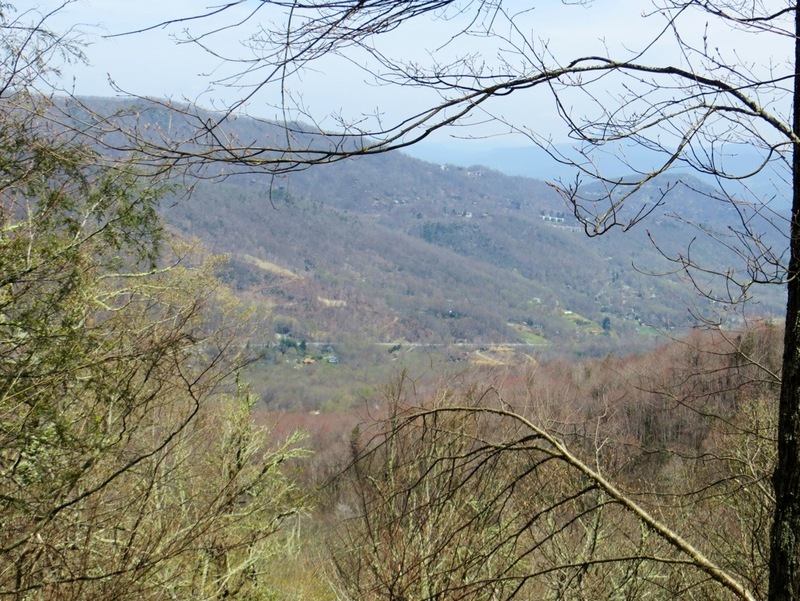 As you can see by the photos just above, the section leaving the Watauga River is very beautiful. 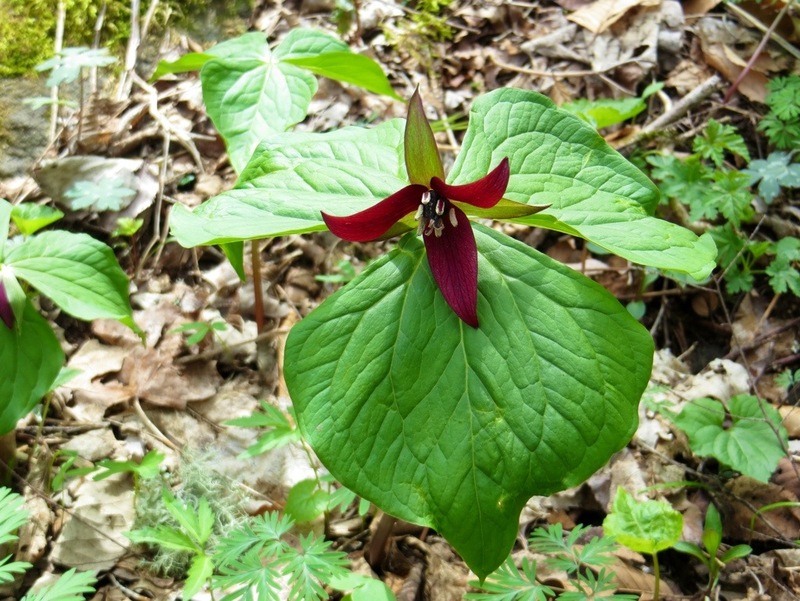 It is early spring at this altitude , while the trees are still bare, the forest bottom is coming alive with greenery. 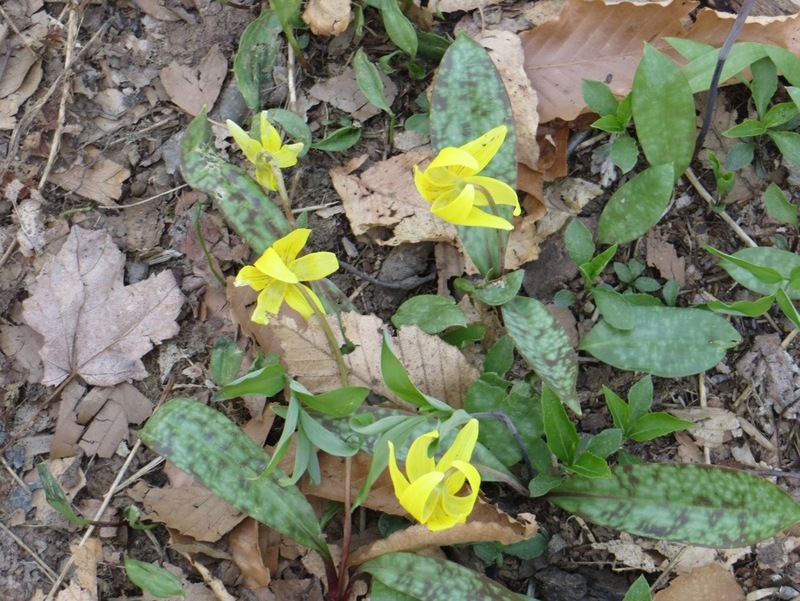 A few early wild flowers were beginning to pop up here and there. The temperature was in the lower 60s with a faded sunshine. It was a beautiful time to be up here. Also, once you leave the river, you can see this huge rock way up in the distance. This is the Profile, although it is undetectable at this angle. The trail eventually leads you under it and to the right of it for just the right view. 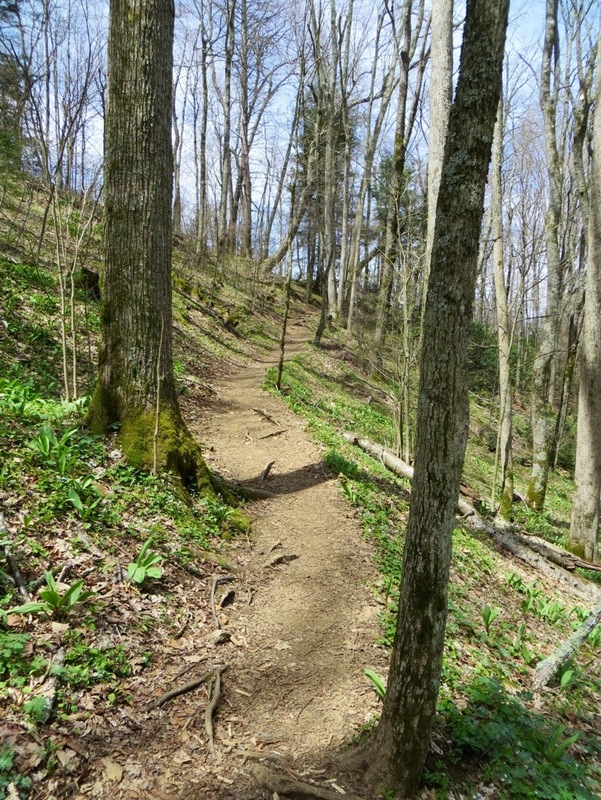 The trail in this section is mostly a hard packed dirt that is pretty wide and easy to walk on. 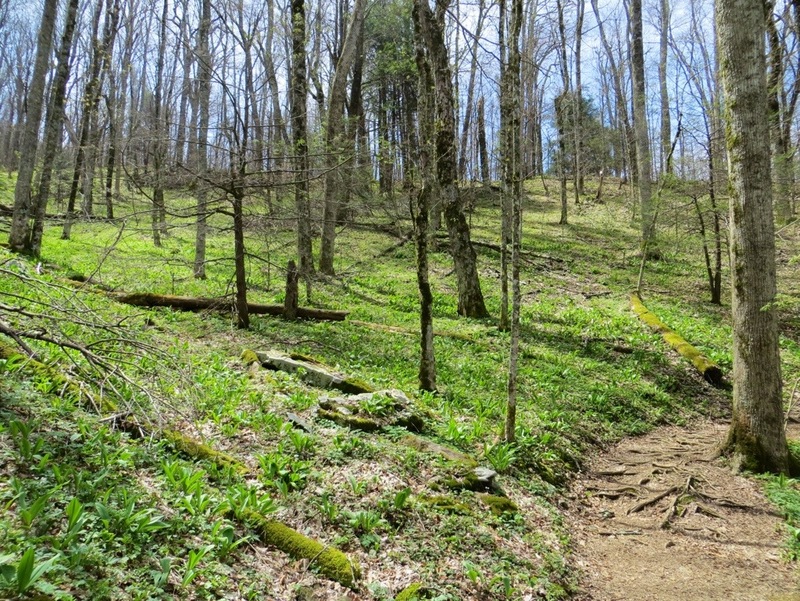 This middle section pretty much comes to a close and the trail changes shortly after the Foscoe View. 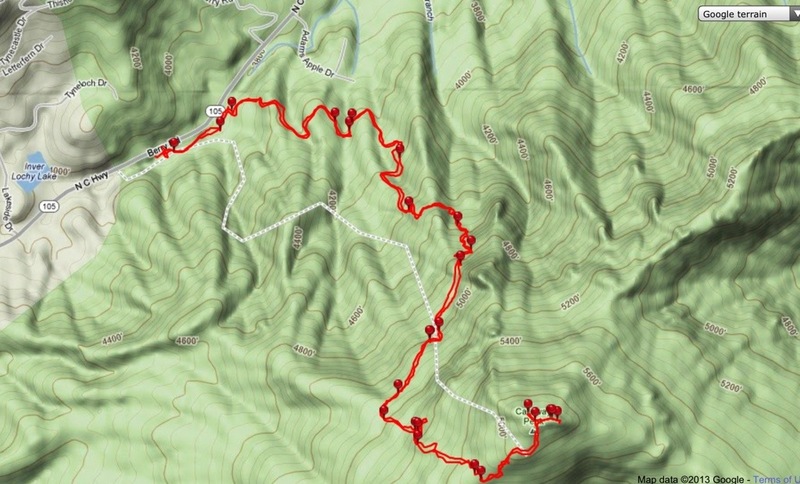 The Foscoe view is along a straight section of the trail about 1 3/4 miles or so up. It is kind of the halfway point, and a good chance to sit down and enjoy this view. Looking back, NC 105 can be seen way down, and it is pretty clear that some serious elevation gain has already been achieved. Shortly up the trail after walking under the huge rock and a few switchbacks, you will find yourself at the Profile View. 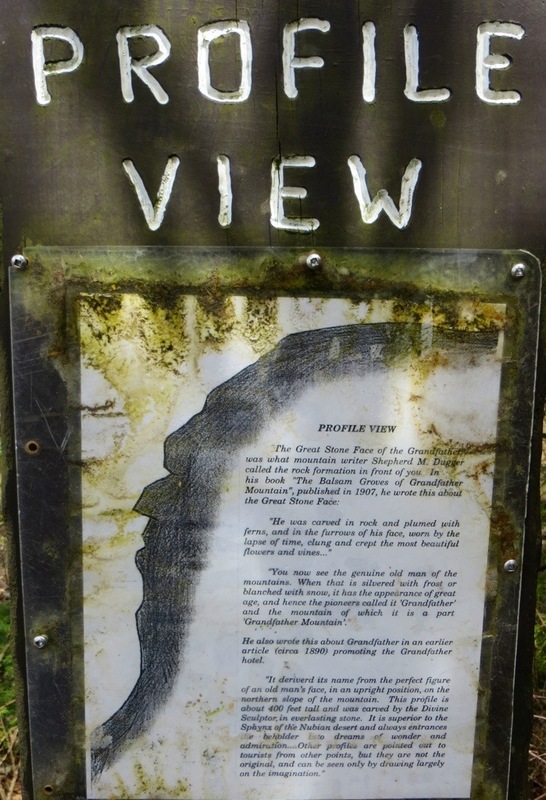 Here is a sign that talks about it and an awesome view of “The Old Man Of The Mountains”. 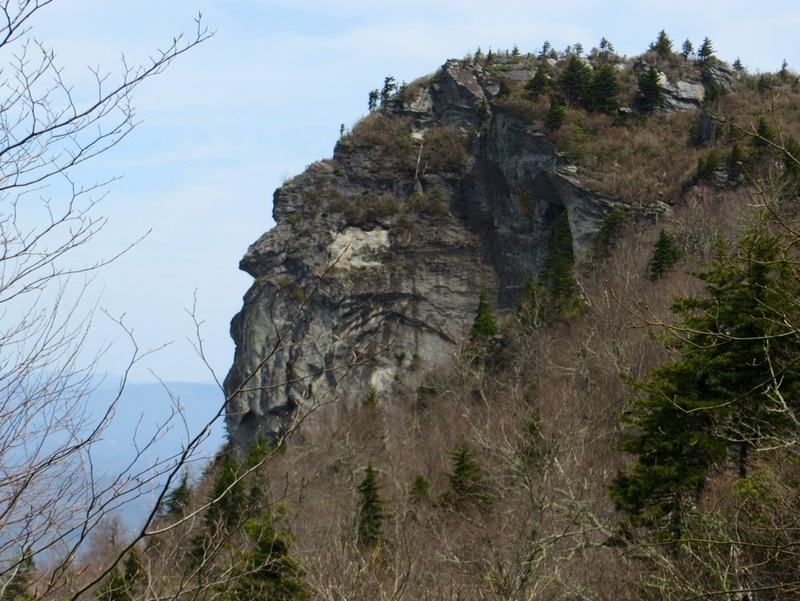 Only at this location and angle does this rock resemble an old mans face. 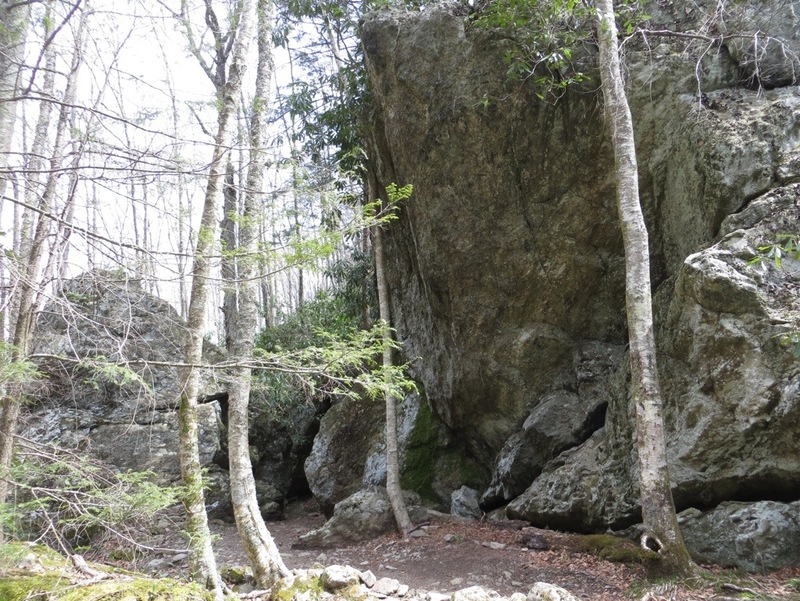 By the time you reach the Profile, the trail will have already transitioned from the easy walking hard dirt to more and more boulders. 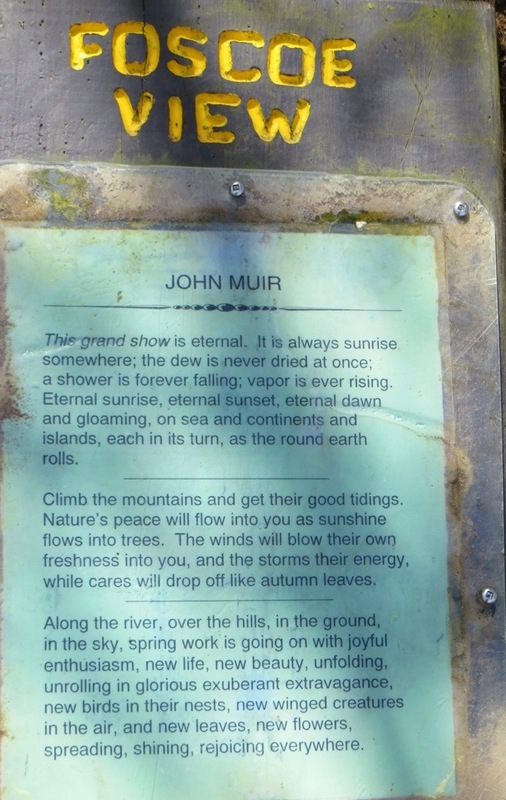 If anything is overwhelming about this trail at this point, this is a good place to turn around….it only gets harder. 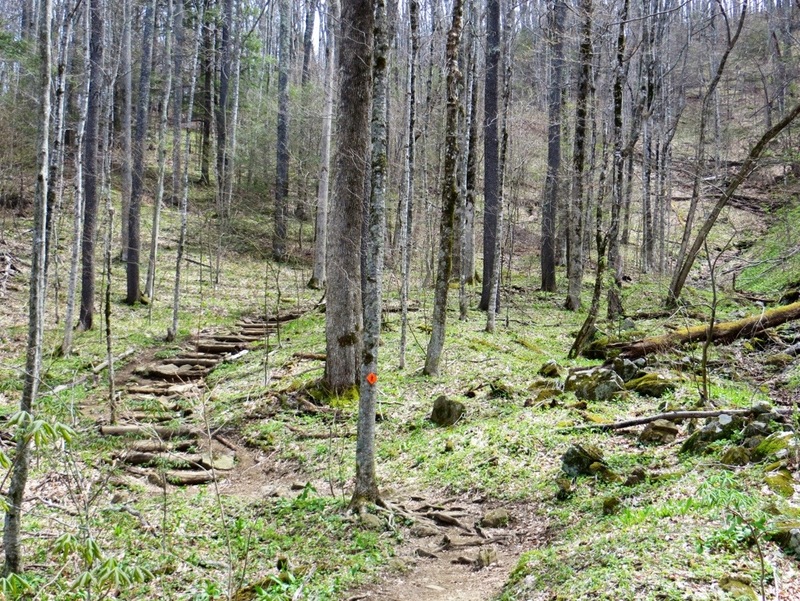 After the Profile, the rocks get bigger, trail gets steeper and the most challenging part of the trail lies just ahead. 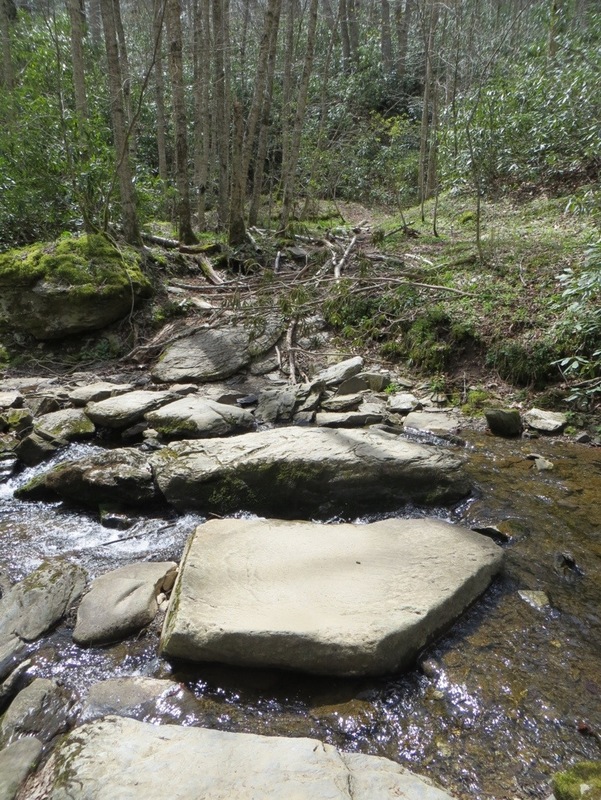 Many small springs and streams are running under and over some of these rocks. Some places you can hear the water under you but see none. Shanty Spring is in the middle of this intense climb. 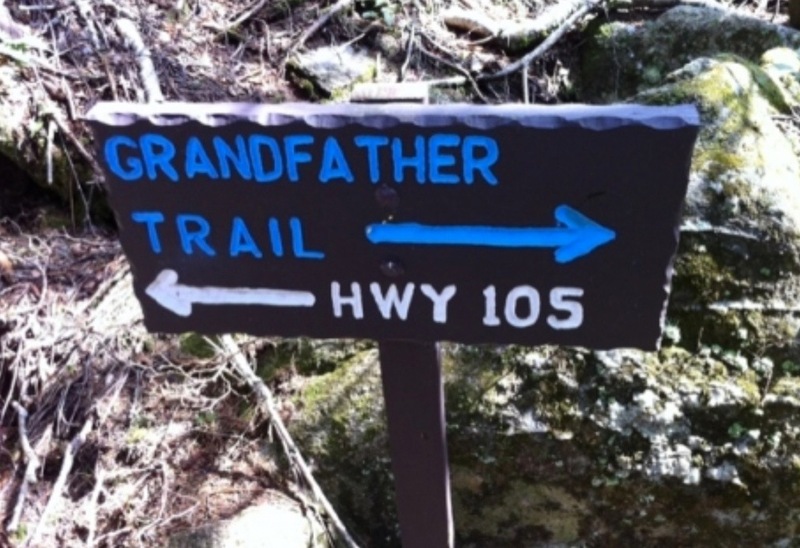 It is marked by a sign and a pipe coming out of the rock. 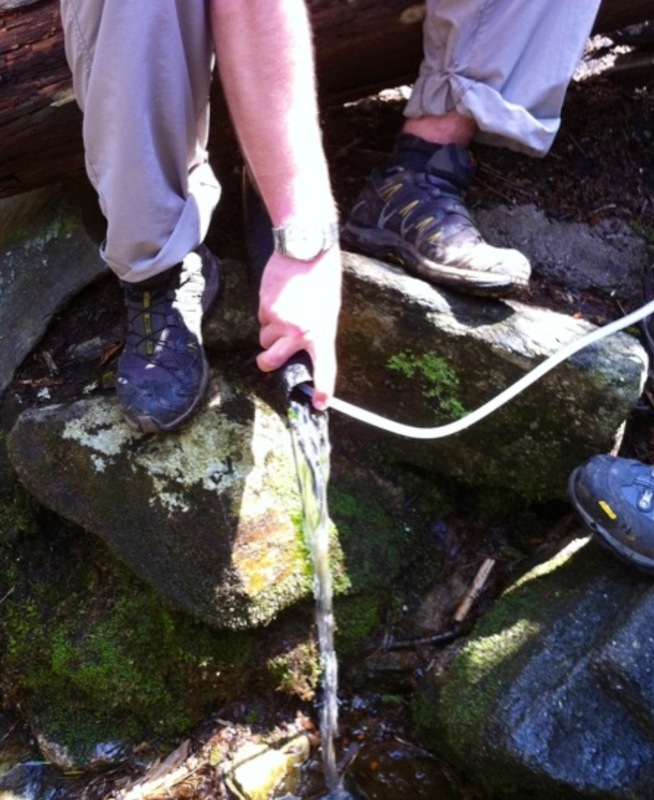 Hikers frequently fill up their water bottles here, after…..running the water through a filter. The last part of the Profile trail is definitely the toughest. 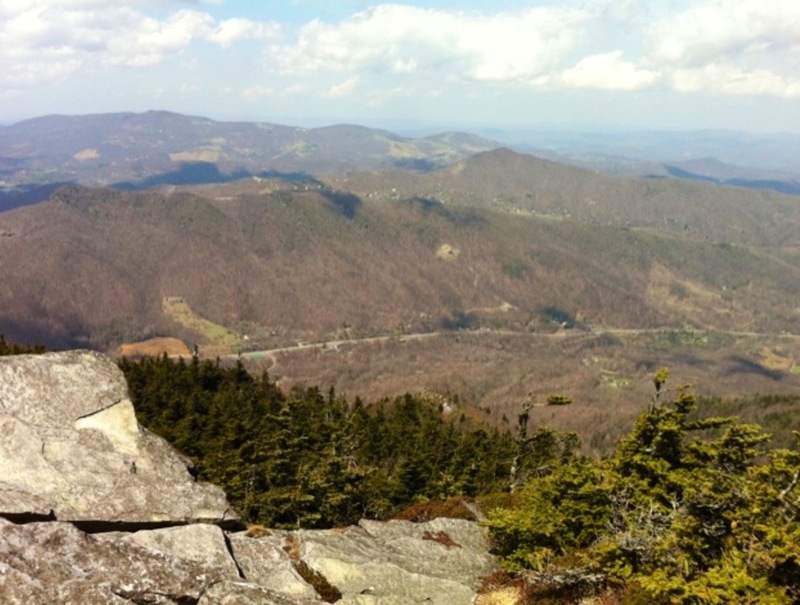 It ends at the Grandfather Trail, with the option of going right to Macrae Peak and the Mile High Swinging Bridge, or left to the Watauga View and Calloway Peak. 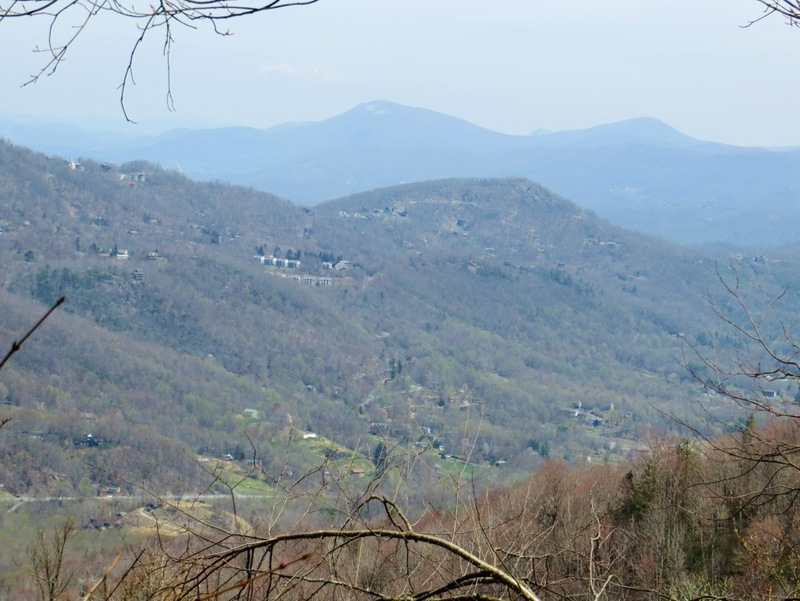 If you plan to go to the Mile High Swinging Bridge, you better get an early morning start as the next 2 miles will be some of the most intense climbing and dropping imaginable . Calloway Peak is close by and my destination so I headed left. 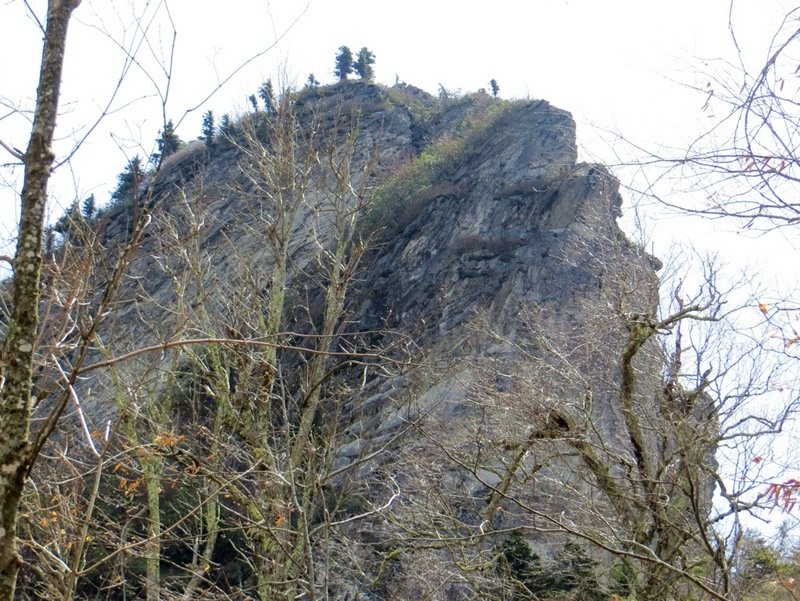 There is some rock climbing at the top, and a few ladders in place where the rocks become too unsafe to climb. 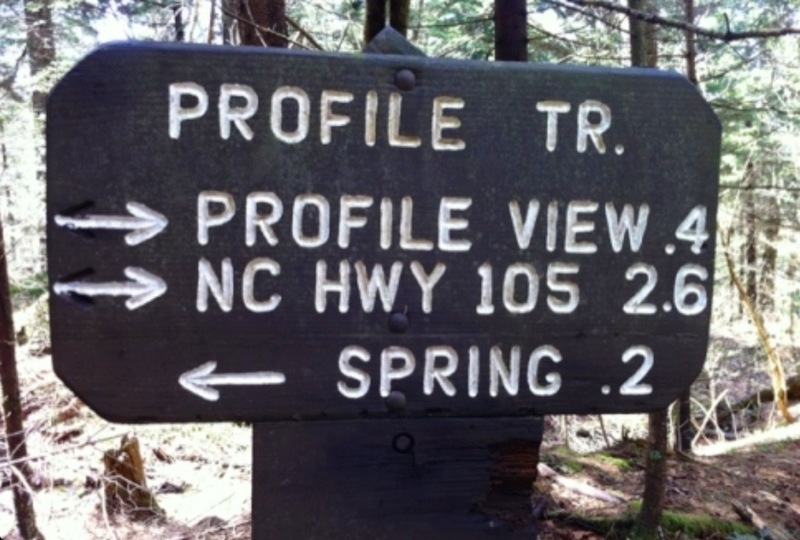 Once at the top, NC 105 will be way, way down the mountain. Enjoy your view up here. 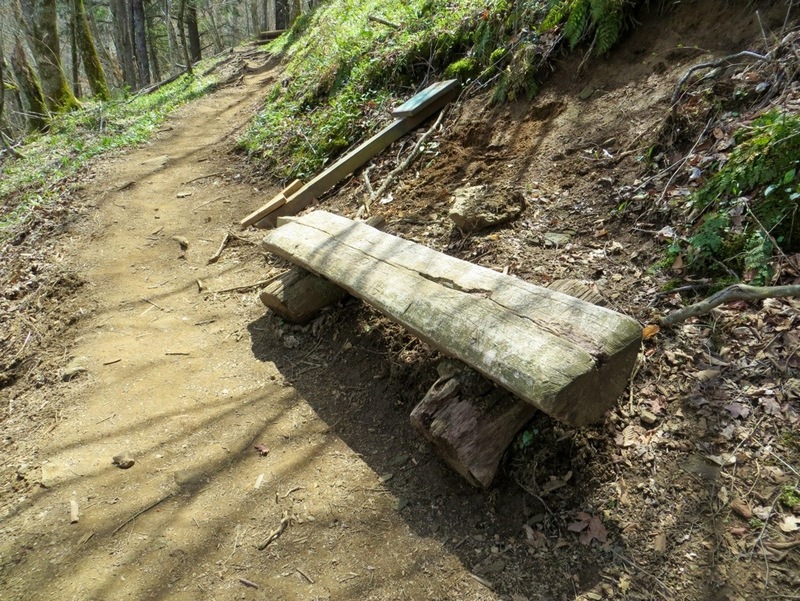 If you got here via the Profile Trail, you will have worked hard and earned it. 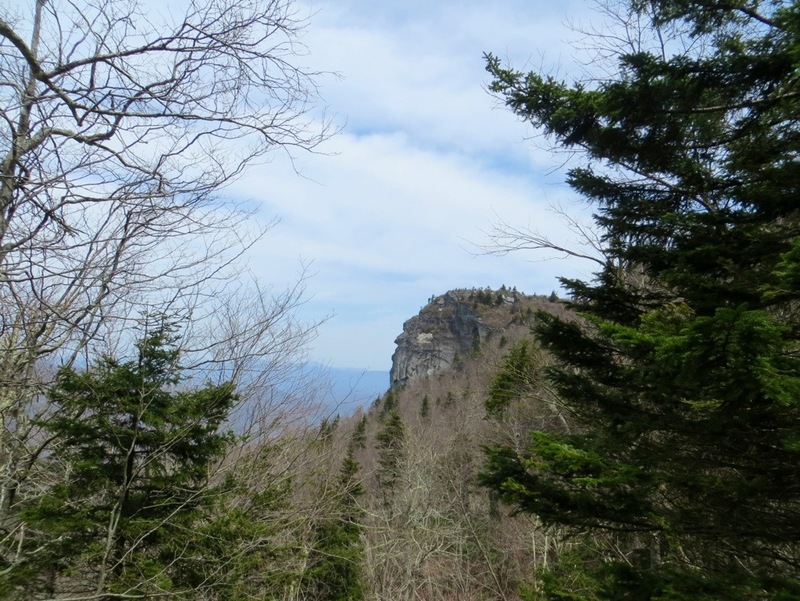 If you plan ahead and take 2 vehicles, it would be great to park one at the mile high swinging bridge and one at the profile trail. 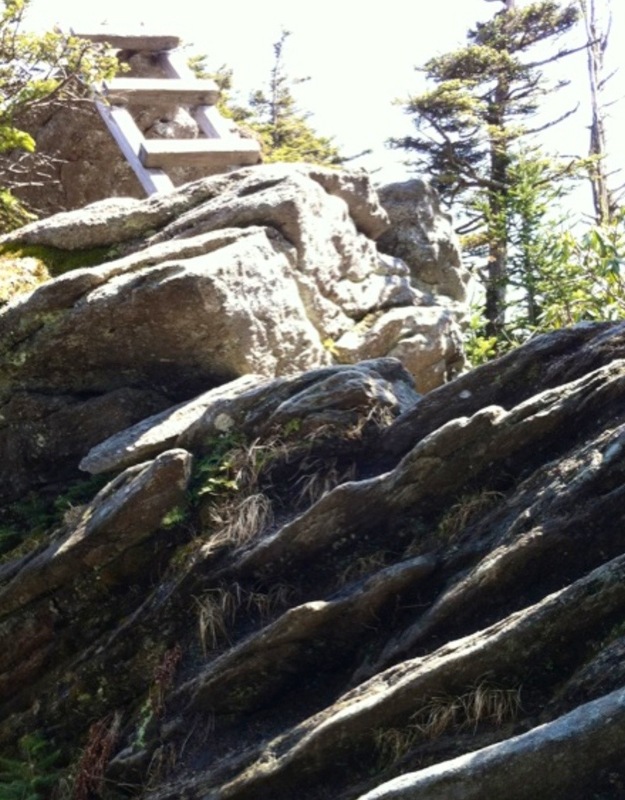 The walk across Grandfather Mountain would be super memorable with some of the most exciting ladder climbing and cable maneuvering I have experienced. 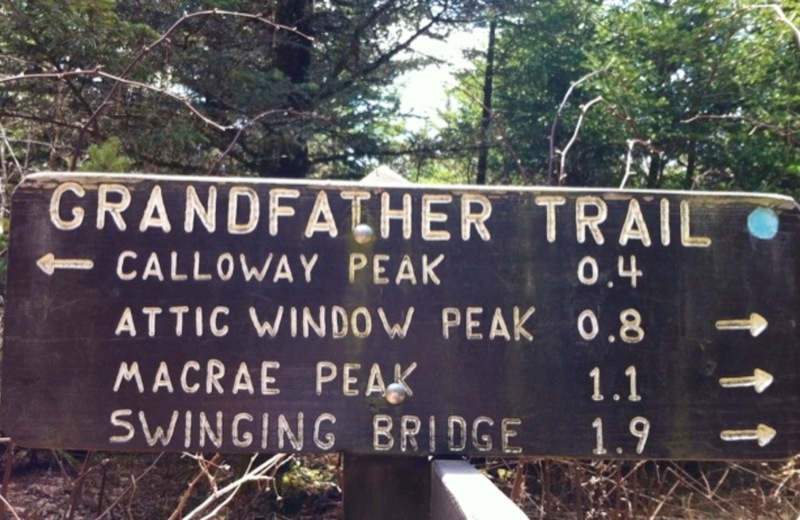 You could then arrive at the mile high swinging bridge, drive down the mountain and pick up your vehicle at the Profile Trailhead. With my one vehicle and just me, I had to hike back down the Profile Trail, which was very tiring and testy for the first mile. 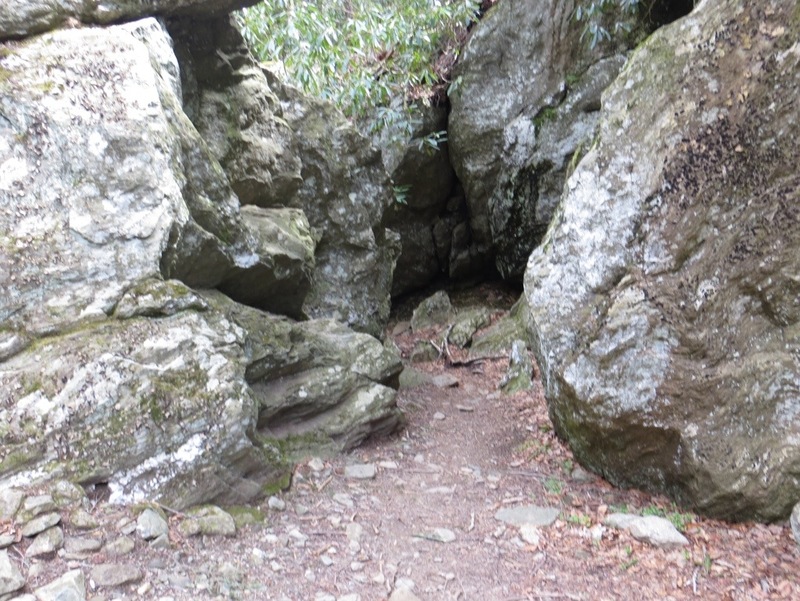 Those large boulders that the trail climbed were equally difficult getting down. Once at the bottom, I was happy to reach my vehicle for some rest. 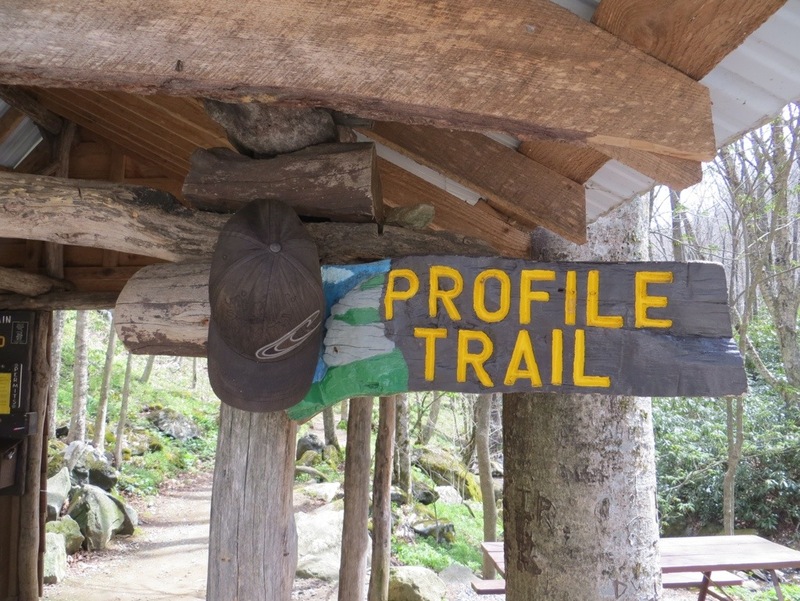 The Profile Trail was steep, challenging, tiring and extremely rewarding . It is definitely one of my favorite mountain climbs.